On one surreal Friday night in 1994, Simpson and his high school bestie, A.C. Cowlings, kept police in an hourslong pursuit so captivating that it interrupted the NBA Finals. Ninety-five million Americans tuned in to watch. FX ups the drama quotient by chronicling the reactions of Simpson’s inner circle, the district attorney’s office and inside the Bronco. We begin with Robert Kardashian, O.J.’s other bestie and one of his attorneys, who is praying in his bathroom for Simpson’s safety after finding a suicide note signed, oddly enough, with a happy face. In another room, Simpson’s lead attorney, Robert Shapiro, is calling the district attorney’s office trying to explain that he’s not responsible for O.J. fleeing. At the D.A.’s office, Gil Garcetti, Marcia Clark and friends are understandably peeved. “If it were our absolute goal, could we look more incompetent?” Garcetti asks rhetorically. He adds that this is worse than the day he was diagnosed with cancer. Clark, who just figured out who O.J. Simpson was last week, is trying to figure out who A.C. Cowlings (an unrecognizable Malcolm-Jamal Warner) is. He’s the most ride-or-die best friend in human history, that’s who. Bill Hodgman explains that Cowlings is “a fourth-rate linebacker. A poor man’s O.J.” Ouch. Inside the police station, officers are receiving tips on O.J.’s whereabouts. My favorite? He’s having lunch with Dionne Warwick at the Ivy. After a tip from some hippies who say they saw A.C. and O.J. driving down the freeway, the police give chase. Eventually they catch up to the truck when it gets stuck in traffic. A spastic A.C. tells an officer with his weapon drawn, “O.J.’s in the backseat with a gun to his head!” For the first time in the episode, we see O.J. (Cuba Gooding Jr.), who is having a code-red meltdown. A.C. drives off as the officers do nothing. “I’m not shooting at O.J. Simpson unless somebody authorizes it,” an officer explains. A.C. calls 911 demanding that the police back off, since O.J. is completely freaking out. 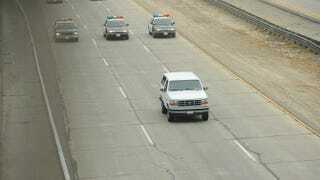 Oh, and the cops need to clear the freeway because they’re headed to Brentwood to see O.J.’s mama. Do you understand the level of gangster you must have to tell the cops to clear the freeway in Los Angeles? Do you understand the power you have when they actually comply? O.J. calls Kardashian from the car phone to tell him he loves him. Um, has he given A.C. this sappy speech? Because this man is aiding and abetting you, a fugitive, without knowing that he’s not going to do time for driving the getaway car. Show A.C. some love. News producers are putting together an O.J. eulogy when Johnnie Cochran (a masterful Courtney B. Vance) shows up at a TV station to talk about the chase. Cochran—who is not yet on O.J.’s “dream team”—takes Simpson’s side, reminding the interviewer that this is America and we believe in innocent until proved guilty. Or, er, we’re supposed to. He also wonders what black man wouldn’t be scared of the Los Angeles Police Department, with its history of “shoot first and offer sloppy apologies afterwards.” Welp. O.J. is still clutching the gun as A.C. finally pulls into the driveway at Simpson’s house. His fingers didn’t cramp up yet? It’s been hours. O.J., who was doing all right for a while, starts squawking like a child, then puts the gun to his mouth as A.C. pleads with him not to pull the trigger. He’s saved by the bell, or, er, the car phone ringing. It’s Kardashian telling him to come inside and talk to Mama on the house phone. I’m unclear why O.J. can’t call his mama from his car phone. Anyway, O.J. finally agrees to get out of the car. O.J. collapses into Kardashian’s arms once he’s in the foyer. He settles on the couch comfortably to talk to Mama and asks for orange juice as the SWAT team stands there watching him. Lawd. This man better be glad he got fame and money. Otherwise, he would have been dead hours ago. Across town, the Dardens are wrapping up their cookout. Papa Darden offers his boy a bit of advice: Stay away from this case. Chris, boo? Listen to your daddy. O.J. is finally in the back of the police car, being taken into custody. The drama isn’t over. Just the day. What did you think of episode 2 of The People v. O.J. Simpson?